We received our Disney PhotoPass pictures in the mail while we were gone, so I thought I should share a few of my favorites! It is so hard to choose, we have just over 200 pictures! Hannah is walking towards Mickey in this picture. I love this one because it shows how excited she is! 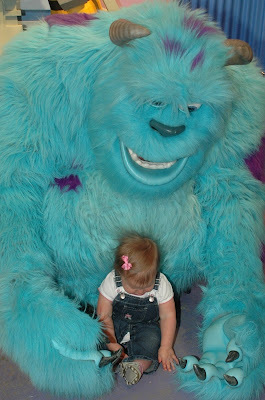 She had so much fun with Sully! She loved the way her head felt rubbing against his fur. Needless to say, her hair stood straight up from the static after we left! We are in Bentonville, Arkansas right now trying to stay warm! It has snowed almost all day in Tulsa, where we were for the Workshop. I think there was at least six inches piled up on the van when we got ready to head this way around 3:00. It wasn't a bad drive. It is mostly slush on the roads and we drove out of the storm within an hour out of Tulsa. Hannah was just in awe. She hasn't "seen" snow since the day she was born. Everytime we walked by the windows, she would exclaim, "Oh!" or "Was Dat? (What's That?)" Since I wasn't really prepared for snow, she only got to play in it for a minute as we were loading the car. She loved it! This trip has already been incredible! Chet and his dad will speak to two different congregations tomorrow here in Bentonville. Chet did an awesome job with his special song, of course. He has been on cloud nine ever since. Tomorrow he gets to sing with Free Indeed, so he may jump up a few more clouds! There is much more to tell, but the laptop is about to die and the power cable is outside in the van! God Bless! These next few months are going to be busy for us! I think we will be on the road just about as much as we will be home. This week we are headed to Tulsa, Oklahoma for the Tulsa Workshop. Chet is going to get to sing a special song on Thursday night during the evening worship. It is actually one that Hessed recorded several years ago, Heal Me. On the way to Tulsa, we are making a stop in Norman where Chet and his dad will present their story to the Alameda Church of Christ (Wed. night). Saturday evening, we head to Bentonville, Arkansas to speak at two different churches on Sunday. We will also be blessed to be able to see many family members on this trip. She found my hat and wanted me to help her put it on. She won't leave her hats on, but decides she wants mine on her head! Hannah enjoying one of her birthday presents. It is basically a high tech rocking horse. 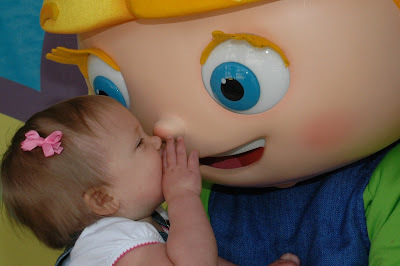 When she bounces on it, the animation on the TV screen reacts teaching her different words, numbers, and her ABC's. She loves it! 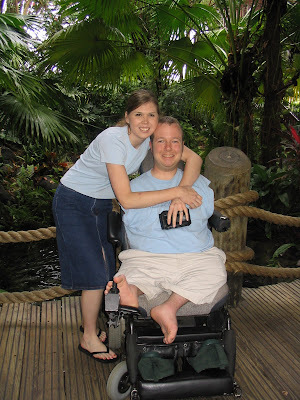 It is hard to believe that is has been just four years since Chet and I got married. We have done so much since then and it has been such an amazing journey! Happy Anniversary, Chet! I love you! Radar decided he wanted to get in on the fun! 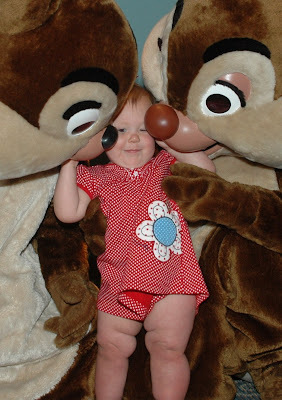 I promise that this isn't staged... we are not forcing our child to like Disney! This is just how we found her today. Hannah has already collected several Minnie Mouse dolls since she was born. We pick up a different one everytime we make a trip to Disney. 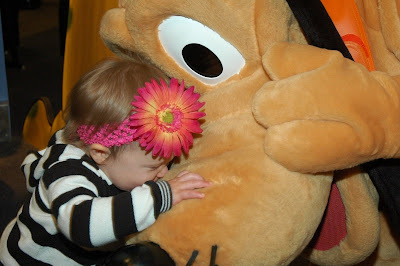 Minnie is her favorite character to visit at the parks and she always reaches for those dolls when in the stores. Today, she had gathered several of them together playing with one for a few minutes and then would put it down. She then picked up another to play with for a few minutes. This continued for at least half an hour. It was so sweet to watch! As you can see, there is a bucket full of other toys spread out around her on the floor. We made it home and are now getting ready for the next few crazy months! In the next two months we travel to three different states (four for Chet!) for speaking engagements and have at least four engagements in the DFW area. Hannah Jane turns one on Friday! We are planning a small party with family for the weekend after birthday. We are doing a Minnie Mouse theme (you didn't expect anything else, right?). Here's a few of the professional pictures we purchased on our trip. The ones with the white background are from the cruise. Just One More Character... Please! We've had a blast these last few days! 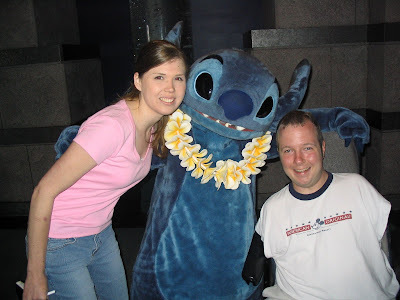 We spent yesterday at Disney's Hollywood Studios. Unfortunately, we didn't realize that it was ESPN Weekend there yesterday, but we still had a great day despite the crowds! There were several big sports stars there (and a lot of crazy sports nuts!). We got to see some big names like Scottie Pippen, Brett Favre, and even the Olympic gymnast Shawn Johnson. We were also able to see the new American Idol Experience. It was a lot of fun! Hannah LOVED it! She clapped through the entire show, laughing and dancing. Watching Block Party Bash, as you can see, she loved it! Today, we started the day with breakfast with Minnie, Goofy, and Donald. They were all decked out in their beach wear. Minnie even came by with a cupcake to celebrate Hannah's birthday. We didn't eat it this time, it was a little too early in the day for chocolate! Hannah eagerly waiting for Minnie to come see her. Hannah was so excited to see everyone. She has started clapping above her head when she is really excited! Goofy was pretending to drink Hannah's juice. She was not too sure about that! After so much excitement at breakfast, Hannah couldn't even keep her eyes open at lunch! She fell asleep in her highchair on the table. After lunch (and her nap!) 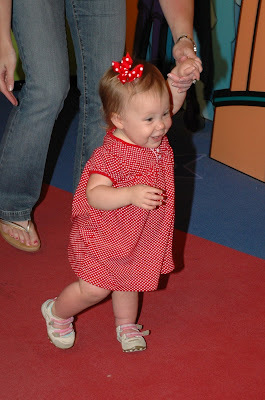 we headed to Toon Town to visit Minnie Mouse's house. We also got to see Minnie along with Mickey inside the Judge's tent. Hannah was so excited to see them! Since she is walking now, she grabs my hand and pulls as hard as she can to get to them!